This week’s image is an historical photo comparison of part of Summit Valley. The future of the Van Norden meadow after it becomes public open space with the acquisition of Royal Gorge by the Truckee-Donner Land Trust is an open question. This comparison shows what the meadow looked like in 1860 before the area was settled, the railroad came through and the dam was built. The area was a dry meadow habitat in the summer. Today the meadow is quite different with a large open water lake surrounded by wetlands that serve as breeding grounds for aquatic birds of many types. 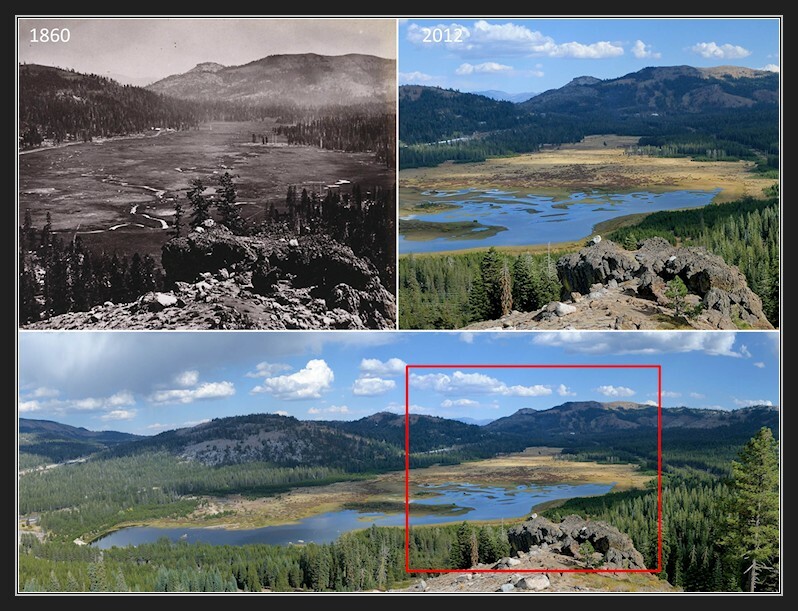 It is also surrounded by a much denser Lodgepole forest that has replaced the the less dense old growth forest of firs and pines that was cut down to build the railroad snow sheds.